Recently a Stroganoff recipe inspired me so much, I decided to make it no matter what. 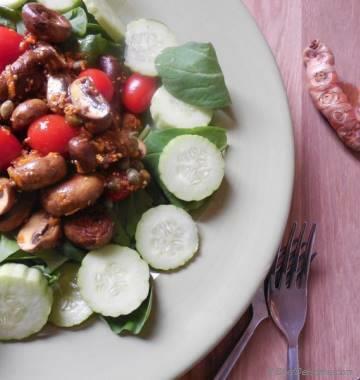 Since I watched Mr. Alton Brown cook mushroom Stroganoff on a FoodNetwork show, I was waiting for groceries day to buy some portabella mushrooms to make creamy and tangy Mushroom Stroganoff. I cannot take credit for this recipe but I did tweak it a little bit to match my taste. 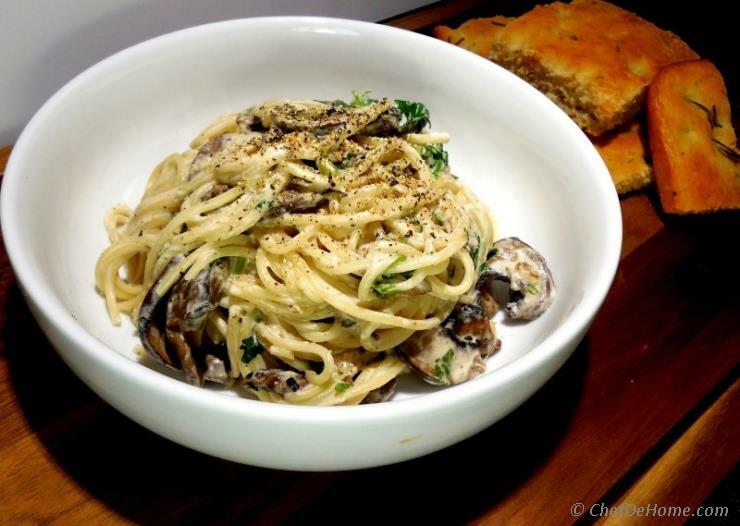 My version of Mushroom Stroganoff is pure vegetarian because I substituted the meat stock which Alton suggested for recipe with homemade vegetarian stock. Also, I have used Spaghetti pasta and fresh herbs instead of wide flat egg noodles and scallions respectively and a combination of portabella and crimini mushrooms instead of just all portabellas. 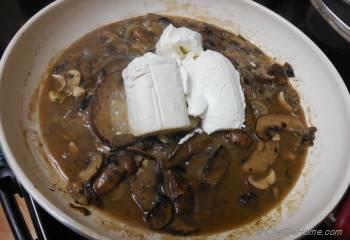 Stroganoff came out excellent, I specially enjoyed paring of goat cheese and sour cream. 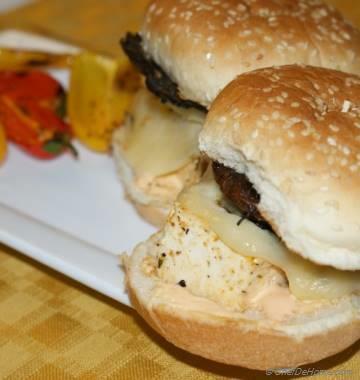 Initially, I was wondering if tangy taste of goat cheese and sour cream will overpower the mushroom flavor but, to my surprise, creaminess of cheese and tangy sour cream went very well with earthy and meaty mushrooms. 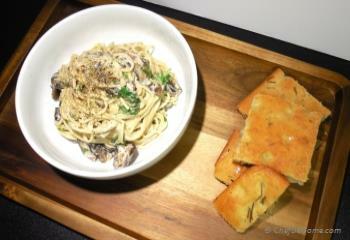 We ate Mushroom Stroganoff for dinner with side of my homemade Focaccia bread and every one in the family loved it. 1. Add the noodles to 4 quarts of cold water in a 6-quart pot, cover and place over high heat. Cook to al dente, 18 to 22 minutes, stirring occasionally. 2. Melt the butter in a 12-inch straight-sided saute pan set over medium-high heat. 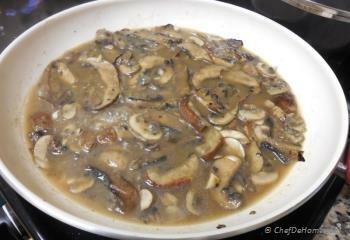 Increase the heat to high, add the mushrooms and sprinkle with salt. 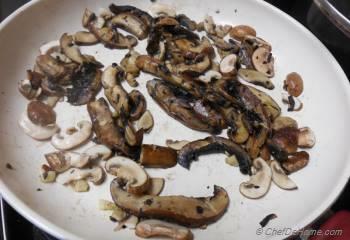 Saute until they darken in color, soften and give off their liquid, 5 to 6 minutes. 3. Sprinkle in the flour and stir to combine. 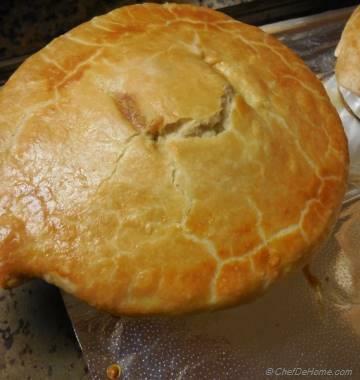 Cook until the flour disappears and the fond on the bottom of the pan turns dark brown, about 1 minute. Deglaze with the vegetable broth. Bring to a simmer and decrease the heat to medium-low. 4. Cook for 10 to 12 minutes, and then add the sour cream, goat cheese and black pepper. Stir to combine, and then partially cover and bring to a simmer to warm through, 2 to 4 minutes. 5. 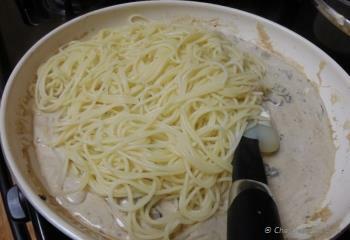 Drain the noodles, add to the pan and stir to combine. 6. Garnish with the chopped parsley and additional black pepper. Serve immediately. 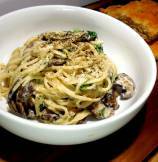 This pasta has muscled its way onto my menu for the weekend. Thanks!